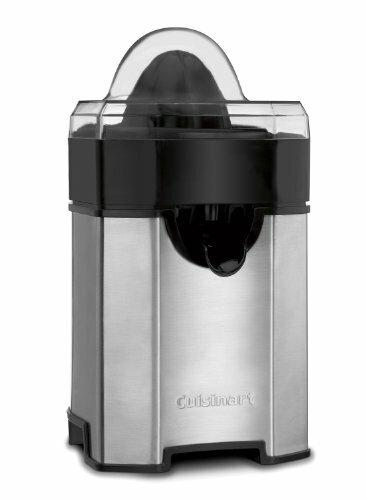 The Cuisinart CCJ-500 is a pulp control citrus juicer that efficiently extracts juice from the smallest lime to the largest grapefruit. The adjustable auto-reversing reamer features custom pulp control settings and the unique final-Spin feature maximizes the amount of juice from each piece of fruit. Dishwasher-safe parts make cleanup a breeze. The Cuisinart Pulp Control Citrus Juicer has many exciting features for users of all types. You can extend the lifetime of your Cuisinart Pulp Control Citrus Juicer with the purchase of a FactoryOutletStore Factory Protection Plan. See the Cuisinart Pulp Control Citrus Juicer gallery images above for more product views. 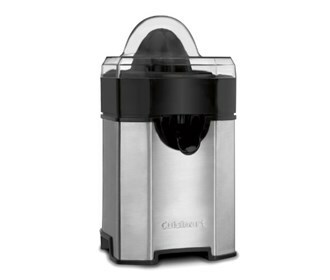 The Cuisinart Pulp Control Citrus Juicer is sold as a Brand New Unopened Item.